It wouldn't be exactly appropriate to call John Dibella an unlikely champion. But if the sports book here at the Atlantis had been taking wagers on this final table, he would have been a prohibitive underdog. Despite everything stacked against him today — a below-average starting stack, amateur status, an impossible seat draw — despite all of that, Dibella has found a way today. The 43-year-old stock trader from Westchester, New York has just climbed his way to the top of the tallest anthill on Paradise Island, winning the 2012 PokerStars Caribbean Adventure Main Event and adding $1.775 million to his career earnings. We feel comfortable calling that a remarkable win considering Dibella's previous tournament cashes totaled just $42,405. Dibella's largest cash up to this point came in 2008 right here at the PCA when he took 60th place for $16,000. You could say he's done just a bit better for himself this time around. To make the story just that much more captivating, Dibella was in the Main Event for just $1,000 after winning a live satellite here last week. Dibella started the final table with 3.465 million chips of the ~32 million in play, and his early trend was slowly and steadily upwards. He was still hovering around the 5-million chip mark with seven players left when he found pocket aces and all-in action from David Bernstein. The latter had a dominated pair of , and the board gave Dibella a knockout and a chip boost up to about twice the count at which he started the day. He was in second place and nipping at the heels of Faraz Jaka by that point, but that would be his high pont over the course of the next few hours as he laddered through the eliminations. Dibella had a three-bet-shoving stack for much of the middle stages of the day, but he finally caught a big break with four players left. It was Jaka who opened with a raise and , and Dibella shoved in with . No problem. The shone right in the window, a life-saving third of a kind. The board ended up reading , and that big Dibella double brought him to within striking distance of the chip leader, Kyle Julius. Jaka did rebound from that crushing two-outer to re-take the chip lead a short while later, but Dibella wasn't done flopping sets just yet. In one of the biggest pots of the day, all three remaining players were dealt pocket pairs — Jaka had pocket sixes, Dibella pocket sevens, and Julius pocket aces! Jaka had the good sense to get out of the way after opening with a raise, and Julius flatted Dibella's three-bet to go heads-up to the flop. To make a long story short, all the money got in on the turn of an board, and Julius' aces could not overcome the full house. That monster gave Dibella the chip lead, and he would not relinquish that spot for the remainder of the night. 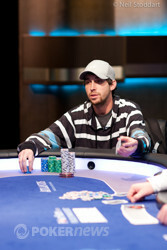 On the final hand, and facing a huge chip deficit, Kyle Julius bluff-shoved the river of a with the airball . It may have worked if not for the fact that Dibella rivered the flush with . Nine hours after he sat down to play with the big boys, the dream has come true for the elder statesman of the table, and his name has been etched into PCA history! 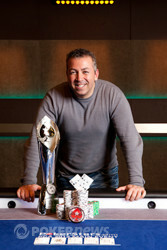 So then, we send our congratulations to the newest member of the PCA Winners' Club, Main Event Champion John Dibella! For his work this week, he'll take home $1.775 million and the priceless PCA Main Event trophy that now bears an inscription of his name. Kyle Julius raised to 825,000 on the button with and John Dibella defended his big blind with . The flop came down and Dibella checked. Julius bet 725,000, but was matched by a quick Dibella call. The hit the turn and both checked, landing the on the river. Dibella bet a cool 1,000,000 with his flush, but Julius represented a big hand and shoved all in. Dibella quickly called with his flush, ending Julius' Main Event run with a runner-up showing. John Dibella limped on the button with and Kyle Julius checked his option with . The flop and turn were checked by both. When the hit the river, Julius took a 475,000-chip stab. Dibella ducked out of the way, giving the pot to Julius. The players are on a 15-minute break. Kyle Julius opened to 650,000 on the button with (what the graphics showed to be) and John Dibella called from the big blind with to see a flop. Both appeared to hit the the flop really well and Dibella checked to Julius who bet 525,000. Dibella, though, went with the check-raise to 1,425,000. Julius called, and both probably loved to see the hit the turn. Dibella bet 1,600,000, Julius quickly called, and the spiked on the river. Dibella's top pair with a flush draw turned into the nuts and he moved all in with the bigger stack. "Well, you said you wouldn't bluff me," said Julius after a good amount of time in the tank, who laid down his trip nines. However, just as the hand completed EPT commentator James Hartigan informed the viewers that Julius in fact held and not . John Dibella was dealt in the small blind, and he opened to 650,000. Kyle Julius defended his big blind with just the flashing on the camera. The flop came , and both players checked to the turn. That was a good one for Dibella, but it was Julius who made the bet of 510,000. Dibella check-raised to 1.51 million, though, and Julius laid it down. 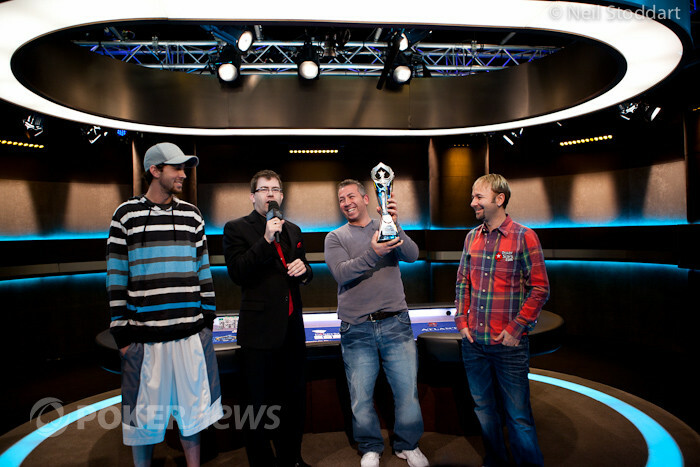 Kyle Julius raised to 650,000 on the button with and John Dibella defended his big blind with . The flop came down and Dibella led out for 650,000. Julius came along to see the turn. Dibella bet 2,000,000, chasing Julius out of the pot to extend his lead slightly.